Hello! I am a sculptor! I've been hired to sculpt prototypes for toys, maquettes for film, and attended gallery shows in California! I also enjoy casting my sculptures in resin. Fun stuff! I work for my talented twin sister, Naomi Romero, and help her run her business and sell at conventions. It's definitely rewarding, but sometimes I wish I had more time to sculpt! I wish to explore more mediums, designs, and work out my comfort zone. 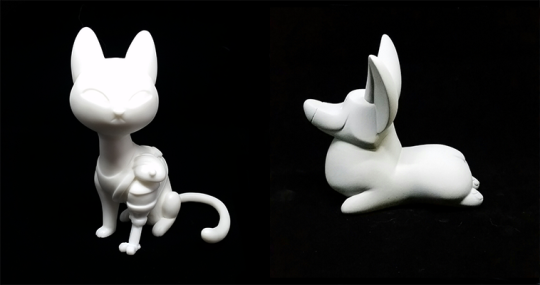 By supporting my Patreon, you will not only be helping me create more sculptures, but you will also receive cool rewards! Want to know how I work? Have questions? My Patreon will have answers and so much more. You will have access to WIPS, videos, streams, and even tutorials which I will not release to the public! By pledging, you will both supporting me and my sister. I can help the financial load, so she can attend less conventions and also focus on drawing what she loves! Win win! I will create sculptures that make me happy, and focus on exploration, work efficiency, and new techniques. This includes sculptures from entertainment. I also plan on offering a lot more resin copies of my work which is a more affordable! Thank you so much for visiting! Any pledge, big or small, will be much appreciated. Thanks so much for your support! You will have access to a blog with future more WIPs and detailed photos than my social medias. This blog will also discuss future projects. Pledge $5 and you will receive.. Pledge $10 and you will receive.. Pledge $25 and you will receive.. I will personally tutor you on your sculptures, answer any questions, offer advice, and make tutorials just for you! You will receive a resin miscast (imperfections, bubbles.etc but nothing unfixable) or exclusiveevery month! Amazing! Ahhh! All bills are covered so now I can focus more on personal projects and in turn, focus more on patreons! Exclusive patreon figures will now be available! Monthly tutorials will now be done on a biweekly basis!